As part of our series on project leadership training, Susanne Madsen, Leadership Coach, discusses the difference between management and leadership. Both skills are essential to effective project management, and Susanne offers strategies to help you blend both. Susanne began this video discussion asking why management versus leadership is a question a project manager should be asking. The answer isn’t an either/or, because when managing a project you’ll be responsible for both. Susanne is fond of saying that you have to manage tasks but lead people. Knowing the difference is what makes you successful at both. Pro-Tip: It needs emphasizing: people aren’t tasks. You cannot schedule, monitor and report on them in the same way you would an abstract work assignment. Sometimes project managers may approach their resources as just another building block to the project, which they are, but people require the softer skills of empathy, empowerment and compassion in order to truly lead your team. Hi, I’m Susanne Madsen. 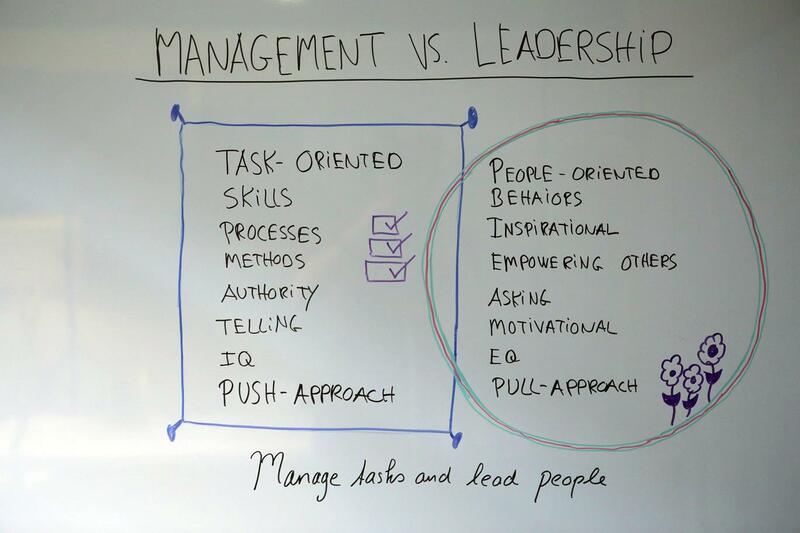 Welcome to this whiteboard session on Management versus Leadership. But why is this important to project management? It’s important because you need to make use of both disciplines. You need to manage tasks and lead people. I see a lot of project managers spending too much time on the management side and hardly any on the leadership side. So let us look at the differences. Management can be set to be very task-oriented. It is very skills based. It’s rational. It’s about events and processes and calculations. Just consider the vocabulary we use in project management. We estimate effort and we calculate duration’s, plus minus 15%. There’s a right or a wrong. It’s very rational and logical. And likewise, the way that a manager relates to people is one of authority. You report to me and you get a salary for doing your job. Hence, you do as I tell you to. That’s rational. So I am telling you what to do. That puts a lot of pressure on me as a manager for knowing it all because I’m instructing you. That I call for a push approach. It is going from me to you. It also puts a lot of pressure on the manager for having a lot of cognitive intelligence or IQ, because they need to know it all. I’m not leveraging the team at all. So let’s look at leadership and contrast. Leadership can be set to be very people-oriented. It is not necessarily about the skills you have but much more about your behaviors and your attitudes. Leaders are inspiring and motivational. They want to understand more about the individual. What are the strengths of the individual? What makes the individual tick on my team? They use that to inspire. But they also paint an appealing picture of the vision where we are going. So again they motivate the individual to follow. You see, following is a voluntary action. You cannot push people to follow, that’s why the leadership approach is much more of a pull-approach. Leaders ask a lot of questions. They don’t just tell you what to do like a manager does. And because leaders are so interested in people and the individual, they have a high amount of emotional intelligence. Of course, cognitive intelligence or IQ is also very important to be a leader. But you cannot be a leader without emotional intelligence. This is about inquiring, listening, and understanding people, understanding human psychology. So, I will leave you with this thought that you need to manage tasks and lead people. You need absolutely to blend these two approaches for being an excellent project manager. Thank you for watching. Please visit us again at ProjectManager.com.